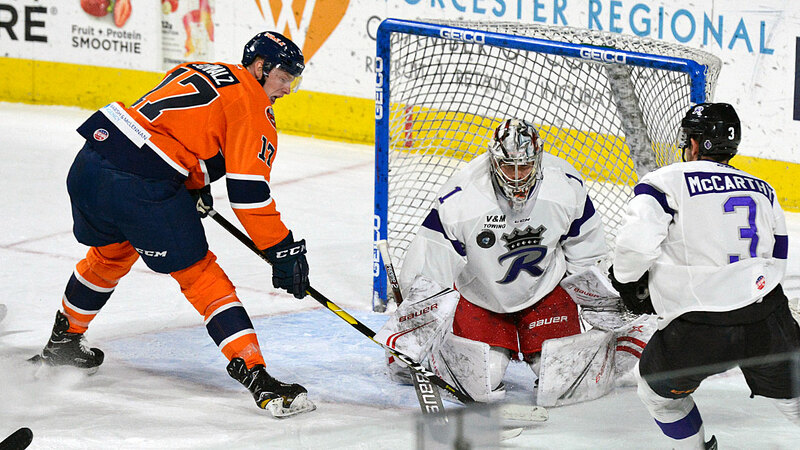 WORCESTER, MA – The Worcester Railers HC (15-16-3-2, 35pts) kicked off a four game homestand with a 4-1 win over the visiting Reading Royals (17-11-3-5, 42pts) in front of 4,324 fans at the DCU Center on Saturday evening. The Railers host the Manchester Monarchs on Sunday at 3pm and will wear a special baseball themed jersey to benefit Be Like Brit presented by Country Bank on a Kids Giveaway Sunday. Bo Brauer (1-1-2), Matt Schmalz (2-1-3), and Nick Sorkin scored for Worcester while Evan Buitenhuis made 30 saves in net for Worcester for his 6th win of the season. David Quenneville and Connor Doherty each added an assist and were each +3 in a game that featured no power plays the entire game as the Railers closed out the first half of the season with a home win. Neither team found the back of the net or ended up in the penalty box in the first period with Reading holding a 9-6 shot advantage through 20 minutes of play. A much better tempo in the second period saw the Railers grab a 2-1 lead after 40 minutes of play. Matt Schmalz (5th) buried a Bo Brauer pass from on top of the crease just 35 seconds into the middle frame to give Worcester a 1-0 lead. Former Railers Frankie DiChiara (11th) made a nice move down the left-wing side and sick handled the puck through the pads of Evan Buitenhuis at 13:40 to tie the score at 1-1. Bo Brauer (2nd) scored in his second straight game after Matt Schmalz rushed down the right-wing side and Brauer batted a rebound from his hip and into the net from on top of the crease at 16:57 past goalie Callum Booth to give Worcester a 2-1 lead. Shots were 19-18 in favor of Worcester through 40 minutes of play. Matt Schmalz (6th) scored a great individual effort goal as he skated down the right-wing side got around a defender before he cut across the crease and sent a backhander off the post and into the net at 10:18 of the third period for a big insurance goal. Nick Sorkin (8th) added an empty netter at 18:54 assisted by Connor Doherty to give the Railers the 4-1 home victory. Notes: Three Stars: 3rd star: Evan Buitenhuis (30 saves, Win) 2nd star: Bo Brauer (1-1-2) 1st star: Matt Schmalz (2-1-3) …. final shots were 31-25 in favor of Reading…. Callum Booth (7-4-1) made 21 saves on 24 shots for Reading…. Evan Buitenhuis (6-7-3) made 30 saves on 31 shots for Worcester…. while Rob Lemelin served as the emergency backup…. Worcester went 0-for-0 on the power play while Reading went 0-for-0…. Kyle McKenzie (inj), Ivan Kosorenkov (inj), Yanick Turcotte (susp), and Malcolm Gould (inj) did not dress for Worcester…. Jeff Kubiak, Ryan Hitchcock, Matty Gaudreau, Mitch Gillam, and Mike Cornell are currently on recall with the Bridgeport Sound Tigers… defenseman David Quenneville returned to the lineup after missing eight games due to injury and picked up an assist and was +3….Worcester finished the season 3-0-0-0 vs. the Royals at the DCU Center and now 7-1-1-0 in nine games vs. Reading on home ice…..Connor Doherty, David Quenneville, Bo Brauer, and Matt Schmalz all finished +3 for the Railers….just a pair of matching roughing penalties were called in the game – it was the 2nd time this season neither team had a power play in a Railers game. On Sunday, Jan 13 the Railers host the Manchester Monarchs at 3pm on a KIDS GIVEAWAY SUNDAY. Worcester will wear a special Railers baseball themed jersey to benefit the Be Like Brit Foundation presented by Country Bank. The first 1,000 kids 12-and-under will receive Railers sun glassescourtesy of Ecotarium. The Railers baseball themed jerseys will be auctioned off by the HandBid App through the end of the second intermission with a select few auctioned off postgame through a live auction. Score a SUNDAY FUNDAY ticket pack which includes four tickets and four beers or four tickets with four sodas and popcorns starting at just $60. Individual tickets start as low as $15 by calling 508-365-1750 or visit RailersHC.com. Save $$$ with a RAILERS 6 PACK which includes six flex tickets and a Railers winter hat starting at $99.